The Augmented Satellite Launch Vehicle or Advanced Satellite Launch Vehicle, also known as ASLV, was a five-stage solid-fuel rocket developed by the Indian Space Research Organisation (ISRO) to place 150 kg satellites into LEO. This project was started by India during the early 1980s to develop technologies needed for a payload to be placed into a geostationary orbit. Its design was based on Satellite Launch Vehicle. ISRO did not have sufficient funds for both the Polar Satellite Launch Vehicle programme and the ASLV programme at the same time and the ASLV programme was terminated after the initial developmental flights. 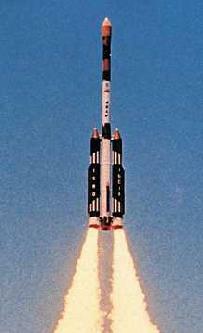 The payloads of ASLV were Stretched Rohini Satellites. The ASLV was a five-stage vehicle. Two strap-on boosters acted as a first stage, with the core stage igniting after booster burn out. The payload capacity of the ASLV was approximately 150 kg to an orbit of 400 km with a 47-degree inclination. The ASLV made four launches, of which one was successful, two failed to achieve orbit, and a third achieved a lower than planned orbit which decayed quickly. The type made its maiden flight on 24 March 1987, and its final flight on 4 May 1994. All four ASLV launches occurred from the ASLV Launch Pad at the Sriharikota Range. For vertically integrated ASLV, many SLV-3 ground facilities were reused but a new launch pad with retractable Mobile Service Structure was constructed within the same launch complex. Orbit lower than expected and incorrect spin-stabilization. Decayed quickly. ^ "ASLV". Retrieved 28 December 2014. ^ Menon, Amarnath (15 April 1987). "Setback in the sky". India Today. Retrieved 18 January 2014. ^ a b c d "Encyclopedia Astronautica Index: 1". ^ Mukunth, Vasudevan. "U.R. Rao, Former Chairman Who Helped ISRO Settle Down". thewire.in. Retrieved 2018-02-20. ^ Indian Space Research Organization (2015). "4.1 The Spaceport of ISRO - K. Narayana". From Fishing Hamlet to Red Planet: India's Space Journey. India: Harper Collins. pp. 328, 329. ISBN 9789351776901. While most of the facilities realised for SLV-3 was utilised for ASLV, a new launch pad was built in the same complex.This was because, unlike SLV-3, the ASLV had strap-ons and was vertically integrated. ^ a b c d McDowell, Jonathan. "Launch Log". Jonathan's Space Page. Retrieved 19 December 2011. ^ "List of ASLV Launches". Retrieved January 8, 2019.